Rheem offers high efficiency variable speed air handlers for multi-stage systems and small compact air handlers that fit in tight spaces without compromise. Rheem's compact cabinets are perfect for tight spaces or where all piping and electrical wiring extend down from above the unit such as narrow closet spaces. Rheem air handlers are the perfect choice where the indoor unit is located in a closet above a water heater. Rheem's front-draw air return makes it possible to mount an emergency overflow drain pan beneath the unit ; above the water heater. 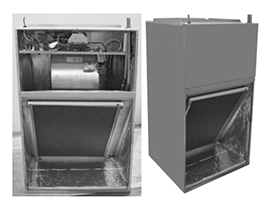 Rheem offers a complete line of Variable Speed Air Conditioning Systems, Multi-Stage Systems and Single Stage Systems. Rheem outdoor air conditioning and heat pump condensing units are constructed of durable materials that hold up well in our harsh coastal climate. and offer many of the same features normally found on more expensive products. Johnson's admires Rheem's track record in southwest Florida ; many Johnson's customers have enjoyed years of dependable operation from their Rheem systems. 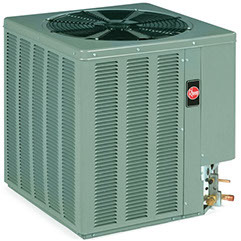 We also appreciate the low cost of Rheem replacement parts when they are needed.